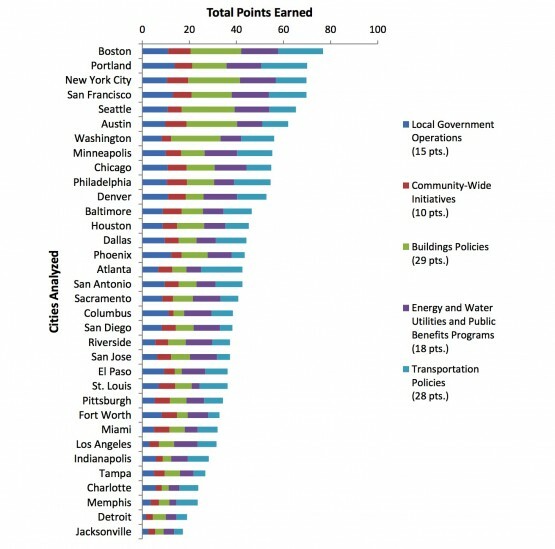 The nation's top city is Boston -- in terms of energy policy, at least. A recent report from the American Council for an Energy-Efficient Economy (ACEEE) ranked 34 of the most populous U.S. cities on their local government, community initiatives, buildings, energy and water utilities and transportation. Beantown only scored about 77 points out of a potential 100 on ACEEE's scale, meaning there's plenty of room for improvement. The 11 lowest-scoring cities (we're looking at you, Jacksonville) fell below the 50 percent mark. “Local governments have great influence over energy use in their communities and many have initiatives that result in significant energy and cost savings," said Eric Mackres, the study's lead author, in a press release. The report aims to help communities see where they need to concentrate their efforts in order to move toward improved efficiency.